Hospitality. It can be intimidating, even scary. You might think your life is too crazy and your house is too messy. Besides, you are an introvert. 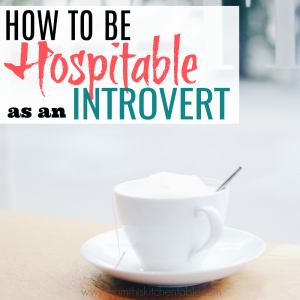 Isn’t being hospitable as an introvert stressful? 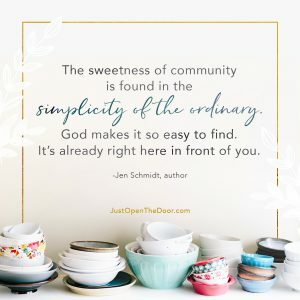 We decided to make this year one of focusing on opening our home and just inviting in those in our lives – even when we otherwise might have considered it too inconvenient, even when it might seem scary. It’s been good, it’s been fun. We’ve gotten to know people, make memories, and have conversations we wouldn’t have otherwise. Coming from an introvert, don’t let stepping outside of your comfort zone or your personality hold you back. You will miss out on so much! 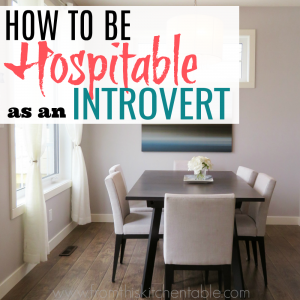 Here are a few tips for you fellow introverts when it comes to hospitality and opening up your home and life. Stop trying to do so much. An elaborate 4 course meal isn’t necessary. You don’t even have to do a meal. Try inviting a new friend over for tea and muffins or having a family over for popcorn and a game. Decorate if it’s your thing, but if not, don’t worry about it. We all have our own lives, our own strengths, our own likes and dislikes, our own way of doing things. You don’t have to try and copy what someone else is doing. He he. This one right here is probably my biggest stressor. 3 kids, working, homeschooling, projects. Sometimes it’s hard to keep on top of things. A perk to our focus on hospitality this year has been to keep the house a little tidier than it typically was. Sure, some days are chaos, but generally we aren’t too far off from a house that’s clean enough for guests. Try implementing a cleaning schedule to make sure you stay on top of things. If everything had to be perfect before I went for it, let me tell you, it wouldn’t happen! House projects take longer than expected. (Living in the midst of one now.) Kids keep on playing. Cooking has to happen. But at the same time, remember that everyone else has the same sorts of things happening in their lives. You opening up your home, especially with real life happening, might encourage others to do the same. Okay, so maybe your home is undergoing an extensive remodeling project. Or maybe right now, trying to clean in order to host people really stresses you out. Don’t let that stop you. Instead, be hospitable elsewhere. Bring cookies and water and meet up with a new friend at the park. Use the coffee shop or a restaurant to visit. Invite a mom to go on a walk pushing strollers. There are so many options. Look for ordinary moments that you’d normally spend by yourself and invite someone to join you. As you begin to get into the habit of opening the door of your home and opening the door of your heart and life, start with a friend. You’ll will have a great time and won’t be as stressed. That will help you be brave and motivated enough to reach out to someone you might not know as well the next time. Have More Than One Person Over. Maybe your biggest stressor is carrying on a conversation or worrying that you won’t click with someone you don’t know well. Try inviting over two friends/couples/families so there will be multiple people to keep the conversation moving. Have over a good friend and also someone you don’t know as well. Most of the time, conversation really does flow easily. As you start talking, subjects naturally come up and you are asking questions and sharing with each other automatically. If you are still worried about conversations, though, think of 10 questions you can ask if you feel the dialogue has stalled. Ask about their kids, interests, hobbies, favorite books or movies, jobs, family life. If you are a good listener, you will most likely have follow up questions that can be asked and the conversations will go deeper – really begin to get to know your guests. Often times your guests will ask you the same questions in return. Relax, and simply enjoy getting to know people! Just decide hospitality is something you are going to do! Don’t stress, just do. It is good. It really is enjoyable, even as an introvert. Take that step and simply invite someone in. 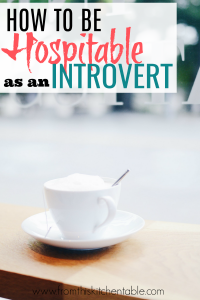 What tips do you have for being hospitable as an introvert? Money is another big obstacle. Be sure to read this post for ideas on ways you can show hospitality on a budget. 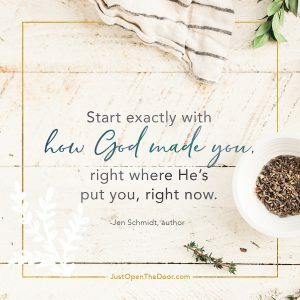 Jen Schmidt has new book out called (affiliate links used) Just Open the Door. She’s the queen of hospitality and loving those around her. 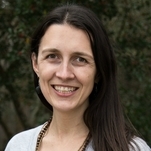 To hear her story and glean from her years of experience you’ll want to read her book! This entry was posted in Uncategorized on April 3, 2018 by Deanna Michaels. This is good advice for me. 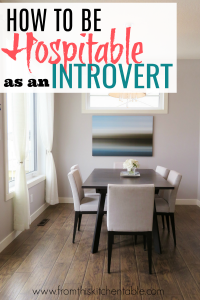 I’m an introvert and this really hard to invite people over. My husband usually is the one who does the inviting, but hosting still makes me nervous. I’m pinning this because birthdays are coming up and I’ll surely have to welcome guests. Greetings from the Inspire Me Monday linky! I really think it gets a little easier the more you do it! Having conversation starters in the back of your brain can ease the conversation anxieties. My hubby and I just attend a Labor Day gathering that taught me so much about hospitality. You are exactly right, the house doesn’t have to be perfect, the food can be informal, there doesn’t have to be a theme. we had a wonderful time spending casual time with good friends. That is what hospitality is all about. Yes!!! The people are what it’s all about. Sounds like the perfect Labor Day gathering.